As promised, here are some 'before' shots of the chair and table that I found at my Goodwill. Even though both items needed a good amount of work, the fact that I only spent a total of $19 for both made it all worth it. They just needed to be cleaned and primed so that they could get new coats of paint. 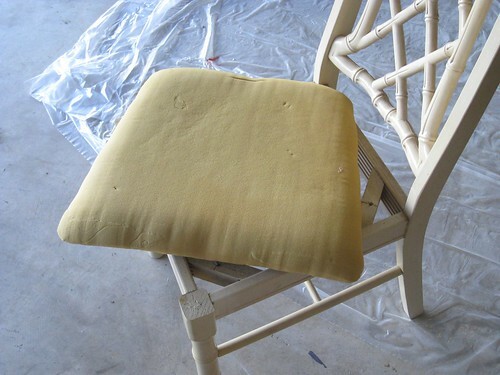 And while the chair needed to be reupholstered, it was really, really easy to do. It took me no time at all and it was kind of fun using the staple gun. The thought of removing all of the existing staples seemed daunting at first, but once you got the hang of it, they was really easy to remove. The foam seemed to have a lot of life left in it so I didn't replace it. Good thing too, it kept our costs down. Not that foam would've been that expensive, but it's just good not to spend more money than you have too. I knew that I wanted to have something colorful and fun since this was going to be the chair that the student(s) that my mom tutors would be using. I got this fun print at my Joann Fabrics and since I had a 50% coupon, it only cost me $5! It really doesn't look like much at all, does it? But it was the right shape that I was looking for in a printer table. Plus, the legs added that bit of charm that I was hoping to find. It would've looked great painted in a glossy black, but since we already had 2 large pieces of black furniture, I thought it would balance the room better by making it white instead. The pink Stockholm boxes from The Container Store look fabulous on the shelves, don't you think? I also wanted to make sure that I got a printer table with shelves since it would need to house the modem as well. 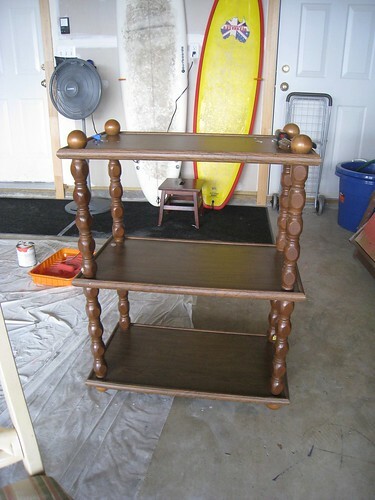 I used Zinsser B-I-N Shellac Base Primer Sealer to prime both pieces. I specifically chose this since it requires no sanding and since both pieces are not real wood. Martha Stewart is seriously my go-to for paint colors. Her prices and choices are unbeatable. I used Martha Stewart Pure White in a high gloss finish for both pieces. I chose a high gloss finish since I wanted an all-in-one process for giving both pieces that glossy look, and I definitely think that it worked. 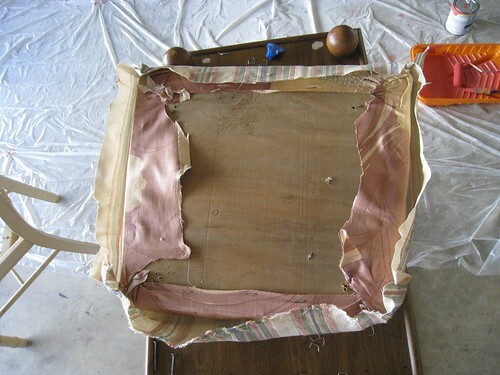 My next project is trying to reupholster this French Bergere chair that I've had sitting in my garage for over a year now. 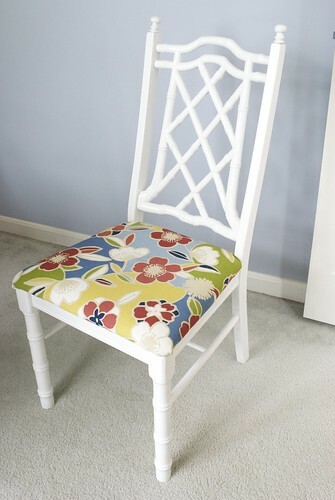 I have Jenny at Little Green Notebook to thank since she just posted a tutorial on how to reupholster a chair. So now I really have no excuse but to get it done asap. What a great job! And the post is great, too. I have an antique Eastlake chair in the basement that may interest you. It's been crying out for an update for years. @Eileen - Thank you!! It was really fun working on them although it wasn't so fun working on them during the insane heat wave we had. 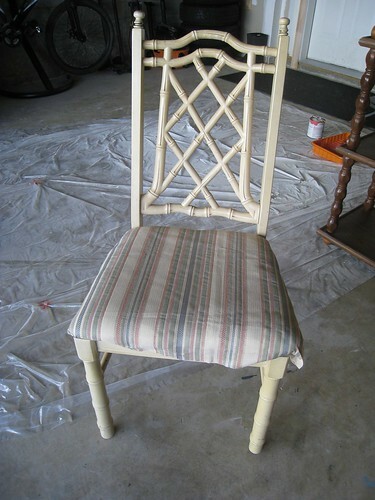 Yes, I'll definitely take a look and see if I can do the chair justice.